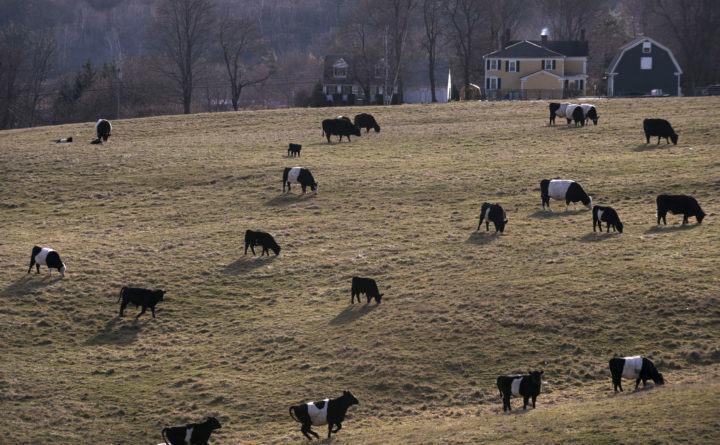 Cattle graze in a field throughout the morning in Hampden in this Nov. 23, 2016, file photo. Can cattle be handled and moved around without all the hooting and hollering that cattlemen are known for? They can, some experts say, and doing so can mean better meat. Known as low-stress stockmanship, it will be a hot topic at the second annual Cattlemen’s College is slated for Nov. 30 and Dec. 1, in Charleston and Orono. “We can move cattle just with the way we position ourselves around that animal, in how we approach their personal space,” said Colt Knight, state livestock specialist with the University of Maine Cooperative Extension. The educational event is organized by the UMaine Cooperative Extension in partnership with the Maine Beef Producers Association. In its first year, it drew about 45 beef producers from throughout the state interested in keeping beef animals to share knowledge, innovations and ideas. “It was very well received and well attended last year, so we’re expanding the event this year to include a live demonstration,” Knight said. The live demonstration on low-stress stockmanship will be from 2 to 4 p.m. Friday, Nov. 30, at Maple Lane Farms, 224 Upper Charleston Road in Charleston, and it will be led by this year’s keynote speaker, Dean Fish, a certified trainer for the National Cattlemen’s Beef Association. Traveling to Maine from his ranch in Arizona, Fish has worked with livestock his whole life, and specializes in handling and breeding beef cattle. “What I hope people will gather from the demonstration is how to move cattle around using the instincts of the cattle and not forcing them where you want them to by swinging sticks at them or yelling at them,” Knight said. The benefits of low-stress stockmanship are many, Knight said. This method of moving animals can improve their quality of life, their health and ultimately, the meat they produce. Stress can also compromise an animal’s immune system, making them more susceptible to disease. And, from the farmer’s perspective, low stress stockmanship can actually be more efficient than traditional ways of handling and moving cattle. Knight will assist with the demonstration and lead Beef Quality Assurance Training, which will include demonstrations on how to administer shots to cattle. These demonstrations will be followed by a Texas-style brisket barbeque dinner from 5 to 8 p.m. at 30 Jones Road in Garland — a social event that will be an opportunity for beef producers to network and have some fun. The next day, on Saturday, Dec. 1, Cattlemen’s College is scheduled from 8 a.m. to 2:30 p.m. at the University of Maine Wells Conference Center in Orono, with a break for a steak lunch. The presentation topics will include pasture and grass-fed nutrition, Beef Quality Assurance Transportation, beef markets, and bovine health. Cindy Kilgore, livestock specialist for the Maine Department of Agriculture, Conservation and Forestry, who will be giving a presentation on cattle import and export markets, said that Cattlemen’s College has information applicable to both new and experienced beef farmers. “Everyone from someone who hasn’t even started in beef to someone who has been doing it a number of years can pick up information from the Cattlemen’s College,” Kilgore said. Participants are asked to pre-register for Cattlemen’s College online at extension.umaine.edu/livestock/home/cattlemens-college or by calling Melissa Babcock at 207-581-2788. Admission is $25 for members of the Maine Beef Producers Association and $35 for nonmembers and includes lunch. The Nov. 30 barbeque is an additional $20. All proceeds to benefit Maine Beef Producers Association Scholarship Fund.